Painting has been a part of my life since I was a kid. I love creating pictures. My favorite subjects are of nature. The amount of beauty in the world inspires me. I could easily spend a lifetime recreating what I’ve seen and experienced, whether it’s a sunset, a plant, or even a simple color combination that is pleasing to look at. Sharing what I find beautiful with others is a satisfying feeling. Moving to Hawaii straight out of college is one of the best decisions I’ve made. I learned how to surf my third day living in Lahaina and west Maui has been my home ever since. Living here is a constant reminder of how beautiful life is. Most of my paintings are from the island’s landscapes. 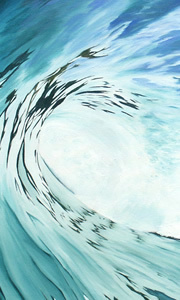 I’ve spent the past few years painting waves from a surfer’s view of the ocean. I’m painting a variety of new pictures these days and I hope to constantly experiment with new subjects and techniques. I’d like to travel more and experience other places around the world. I look forward to how that will inspire my future works.